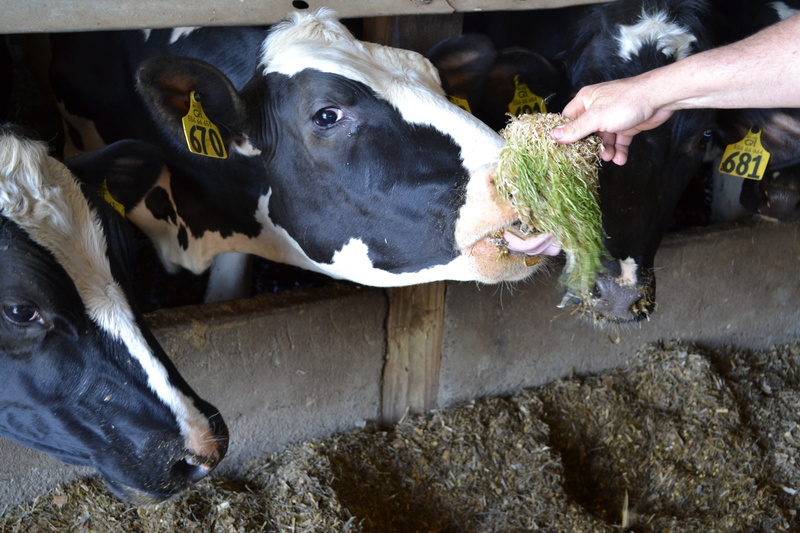 Sprouting barley and other grains for dairy cows (and other livestock) is not a novel practice, but has gained more popularity in the past few years as grain prices rise and farmers search for ways to maximize their return on grain purchases. This Facebook group serves as a forum for dairy farmers and homesteaders who want to know more about using sprouted barley fodder as feedstock. Connect to the community of fodder producers and dairy farmers by posting questions and pictures and engaging with the group’s resources. Sign in to Facebook, and then click here. -John Stoltzfus, a dairy farmer in Whitesville, NY who has produced fodder for his 50-cow dairy herd, spoke about his methods for sprouting barley, the problems he’s encountered in his system over the past two years, and what he’s learned since our previous webinar in 2012. -Fay Benson, an educator at Cornell Cooperative Extension, discussed the topic of nutrient availability in sprouted seeds, and how this process can benefit the animal, as well as minimizing nutrient losses to the environment. -Romi Wilson, a graduate student in Horticulture at Cornell University, talked about seed issues relating to sprouting fodder. She will present on the physiological process of the first 12 hours of a seed germinating, and review the water uptake during the first 6 days of sprouting.